There was a time when energy costs were such that focusing on insulation choices for a home or building was not a critical decision. With spiraling energy costs and greater expectations related to comfort and environmental responsibility, insulation has become an increasingly important consideration. 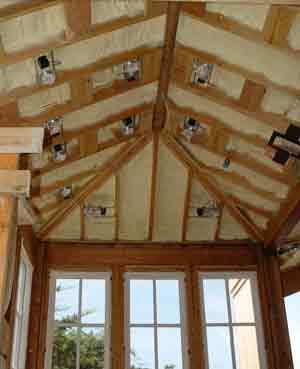 Spray foam insulation uniquely meets the higher expectations of today's insulation environment. As an interior insulation, dense foam provides a 6.8 R-value per inch. Even more importantly according to much of the research conducted is that it provides an air barrier to eliminate leaking. A single inch provides roughly 80% engergy efficiency and additional depth and foam can add incremental R-value and energy efficiency until a desired level is achieved. Foams extreme adherance and ability to conform to any shape to which it is applied make it perfect for external insulation needs on roofs, tanks, piping, ribbed/fluted areas or otherwise oddly shaped surfaces. At over 6 R-value per inch it can eliminate the buildup of heat under a roof in the summer and hold in heat during the winter. 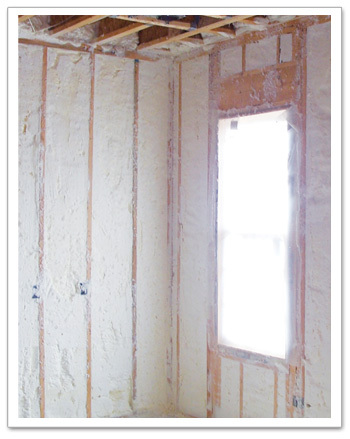 As an interior insulation, dense foam provides a 6.8 R-value per inch. Even more importantly according to much of the research conducted is that it provides an air barrier to eliminate leaking. A single inch provides roughly 80% engergy efficiency and additional depth and foam can add incremental R-value and energy efficiency until a desired level is achieved. 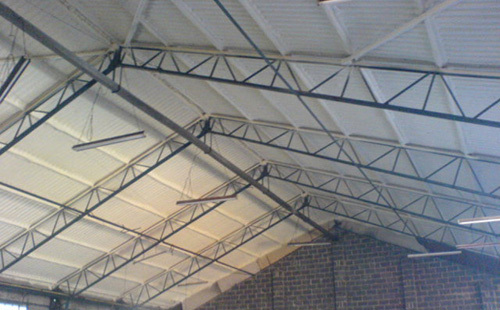 Foam is a particularly outstanding choice for the interior of metal buildings. Because it is sprayed directly to the walls and ceilings it not only eliminates condensation within the building, but eliminates the condensation that can develop inside between the metal and other types of non-adhering insulation. This stops the rusting of the metal from the inside as well as reducing potential for mold and mildew. Many buildings can be sprayed with as little as one inch of foam and produce dramatic differences in the comfort and usability of the building. Where the foam is not being covered with drywall, it can be painted to provide high reflectivity and can be hosed down to keep it clean. Foam is receiving great acceptance as an air barrier on the exterior of commercial buildings. It has proven an extremely efficient and cost-effective choice with masonry walls. Replacing a seamed "wrap" with a 7-10 insulation R-value that provides a proven air and moisture barrier and is much more resistant to outside noise is an obvious upgrade. Used inside homes and buildings foam's expansion capabity allows it to fill cracks and crevices; even with particularly troublesome areas such as plumbing, wiring entries it provides a tight seal against air leakage/penetration. The industry generally suggests a roughly 40% reduction in energy costs for homeowners; on top of savings from being able to downsize HVAC equipment (While estimates usually suggest that units can be downsized about 30%, in practical application most HVAC firms will downsize about 20%). Foam has received numerous awards for being eco-friendly. For homeowners it may be more important that it is family-friendly. It reduces the potential for mold and mildew, contributors to allergy and other problems. It helps keep a home at the desired temperature with minimal air leakage, meaning less kicking-on and off of HVAC equipment. It provides much better protection from the infiltration of negative outside influences such as air, odor and sound. Ability to insulate is achieved by creating dead air space in minute air pockets in and between product fibers. Acoustics in both noise reduction and sound transmission control are achieved by the product’s ability to trap sound in and between the interlacing elastic fibers. Corrects noise and reverberation problems efficiently and effectively.